Freelance writing and editing, past professional work, and random moments. Hot, hot, hot. 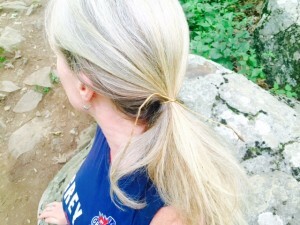 That was the weather in Virginia this past August when we visited and hiked a portion of the Appalachian Trail–aka the “A.T.” Long hair is versatile, but when you don’t have even ONE hair tie or clip in your pocket and the temperature is 30 degrees Celsius, you sort of want to chop it all off. Piling it up and piercing it with maple sticks, chopstick style, didn’t work for me–but this dead root did. Highly recommended as a wilderness beauty-and-comfort tip! 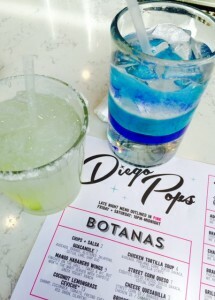 Diego Pops in Scottsdale makes a delicious margarita. After a few days of cycling in Arizona and checking out Sedona, for my last day I went for a quick lunch at this place called Diego Pops in Scottsdale. There’s NOTHING like a margarita reward. And this one was so good–I got to savour the fresh memories of a lovely sojourn to the desert, my first time there and a warm escape from Toronto’s winter, while sipping on this concoction of fresh lime juice and smooth Tequila. A highly recommended experience. I spotted quintessentially Canadian scene this recently when walking through downtown one evening after work. 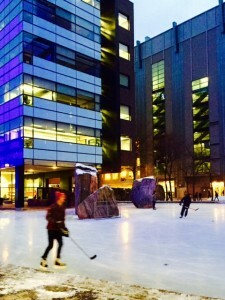 The Ryerson University campus has long had this skating rink, smack dab in the middle of downtown Toronto near Yonge-Dundas Square. I love the big granite boulders that sit on it, and that all winter long anyone is welcome to grab their hockey stick and play a little pick-up hockey. Pick-up hockey at Ryerson’s downtown Toronto campus. 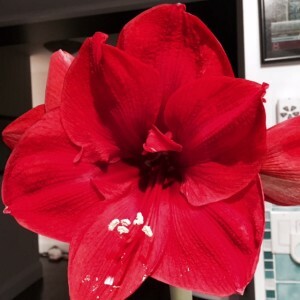 It’s native to South Africa, but this lovely bloom brings such fresh beauty to cold-climate homes during the Christmas season. Just wanted to share this late-bloomer with you; it took its time, bursting to life in the days following January 1. A pretty way to start 2015. 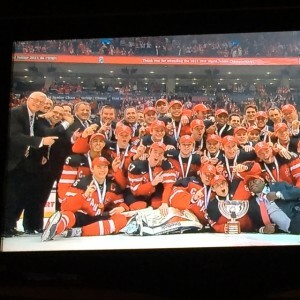 Finally, for the first time since 2009, the long wait was over this week when the Canadian Men’s Junior Hockey Team won the gold medal in a thrilling game against Russia. In the end it was 5-4, and what a ride: watching the second period was especially nerve-wracking as Russia had the momentum. But sportsmanship and skill were on the side of the Canadians. Love that feeling of pride. Way to go, boys! Unforgettable moment: The gold-medal team. On a recent cold and rainy day, I found myself hungry for lunch, so I ducked into a ramen shop on Queen St. West, near Spadina, in downtown Toronto. I love Japanese food and had been wanting to get a taste of the latest craze–ramen shops. I wasn’t disappointed with the bowl of steaming noodles (ramen) with sliced chicken and bean sprouts in a miso broth, but what truly warmed me up was a gorgeous mug of Japanese green tea. 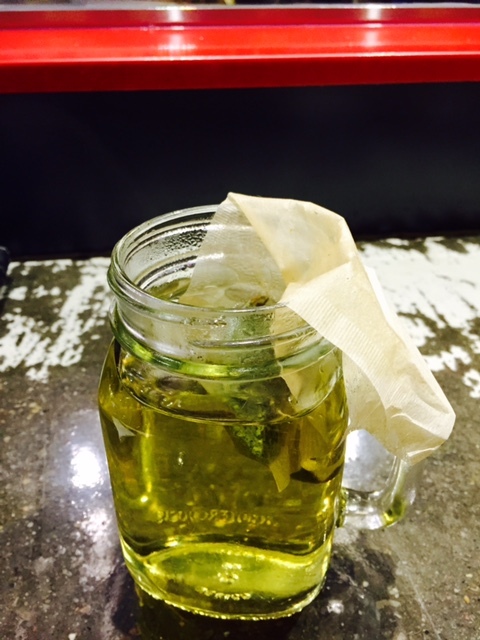 There is something so beautifully delicate about the lovely colour and taste of Japanese tea–which happens to have the benefit of being a super source of polyphenols (associated with prevention of heart disease and cancers)–that I had to share this moment. It was chilly outside, but cosy inside…and the view was beautiful. Great way to start the day! It might be the nice camera in my new iPhone 6, but I seem to be noticing beautiful scenes more often lately, and capturing them. 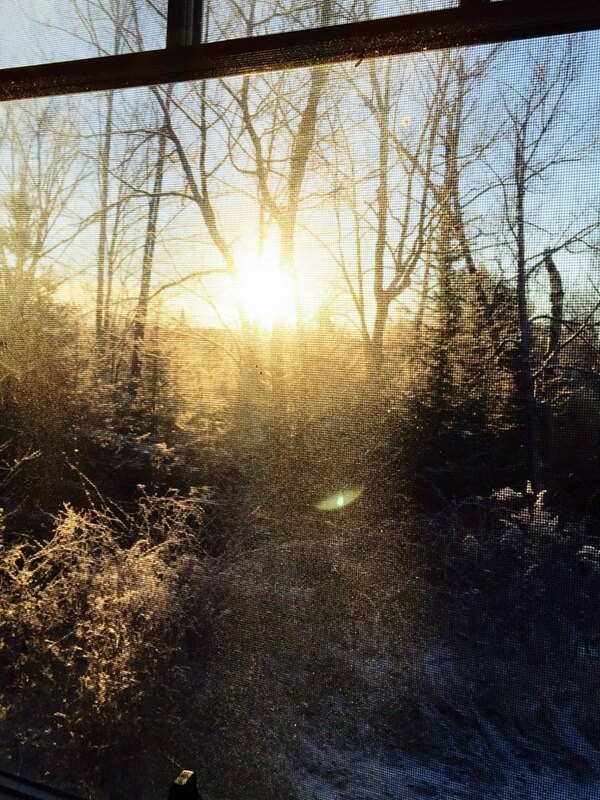 I love this natural, woodsy view from our cabin’s bunkie. At this time of year, early winter, the sun rises just outside the window (it then tries to climb but never makes it very high). 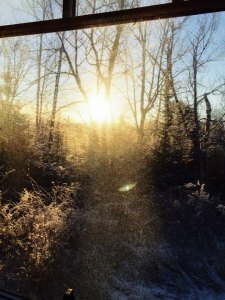 I see this sunshiny start a glimmer of hope for a fresh, beautiful day.